Long Horn and Cattle Egret in the Pasture. Cattle Egrets often visit with the Long Horns in the fields. Hence the name "Pasture Buddies." This Long Horn was grazing in a field next to the dirt road. We were told to take this route by a local, to go somewhere Northeast of Steamboat Springs, to see something we never found. Fortunately, this lady was a great find. She was close enough to the edge of the road we weren't willing to get out of the van to take a picture. She was happily grazing, munching away on the weeds. We had no intention of disturbing her. Once the decision was made to paint her, the plain grassy pasture background was boring and uninteresting. I found a photo I had taken of the pasture next to the Flying J Ranch on HWY 73, close to our house. This made a much more interesting composition with lots of color and depth. It is still a Colorado scene. 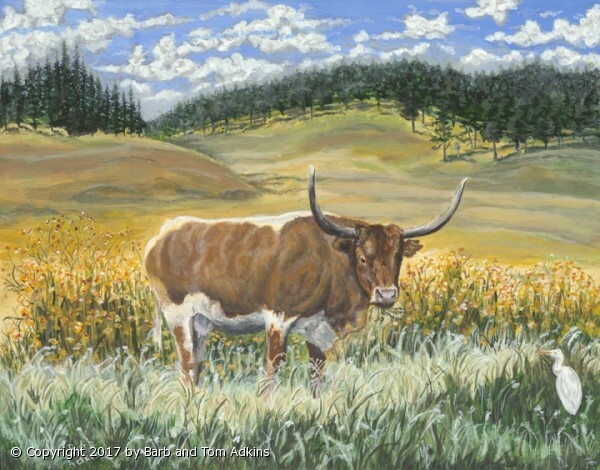 Maybe the next Long Horn painting will be of a Kansas ranch with a totally different kind of Long Horn and a cattle egret picking bugs off his back. The herd may be involved in that piece. Time will tell. The Painted Gallery Edge on Silhouette Framing gives the painting a Third Dimension and brings one into the picture as you approach it from any direction.